I had a wonderful evening with Kimi, Cindy, and their families tonight. Kimi and I have been great friends since 9th grade. Amazingly, Cindy and I first met in 7th grade!! Cindy and her daughters are visiting from Minnesota. We are so lucky that our schedules overlapped and that we were all able to see each other this week!! Thank you, Kimi, Manuel and Matteo for hosting. I had a great time, and am so happy we were all able to spend the evening together. I had heard about this exhibit earlier this year, and am so glad that I was able to find time while I was in San Francisco to see it. I've been a fan of Mary Blair's art for a very long time. She was an incredibly talented artist whose work and style influenced several of the most beloved Walt Disney films, including Cinderella, Peter Pan, and Alice in Wonderland. Her style is most recognized in the Disneyland attraction, "It's a Small World". If you are in San Francisco, and have a chance to see this exhibit before it closes in early September, I highly recommend it! I accidentally forgot to start my Walkmeter app when we started, and only remembered to start it about a mile in. We had a nice walk through the Presidio, which included a very picturesque walk through the San Francisco National Cemetery. The cemetery is going through some renovations right now, which was interesting to see. It's a beautiful location and very peaceful to walk through in the early morning. We had a short break at the newly renovated Lafayette Park. We continued our way across Van Ness to Polk Street, and walked down Polk Street to Bay. From there, we walked through the Marina, and through the always beautiful Palace of Fine Arts. From the Palace of Fine Arts, we were back in the Presidio. One of our new favorite traditions is to enjoy "Off the Grid" at the Presidio when we finish our walks on Sundays. Our cars are already parked across the street from the grassy area where dozens of food trucks come in every Sunday during the summer. We spread out some blankets, bring some lawn chairs, and have some tasty treats and cold drinks together. So much fun. We had an early Birthday dinner for my Mom at the Benihana in Cupertino tonight. Here's the photo taken by the restaurant. Back in San Francisco, and back to training! I had a wonderful morning walking 10-miles with our group today. I'm a bit partial to urban hiking versus trails, especially since I've moved away from San Francisco, so today's walk was just perfect. The weather was much warmer than I was expecting. It had been foggy in the morning, so I dressed in a tank top, a long sleeved shirt, and a light jacket. The jacket and shirt came off within the first mile. No complaints. It was a beautiful day! Today's route has always been one of my favorites. We walk through the Presidio, along Crissy Field, along the Marina, around Fort Mason, along Aquatic Park, through Fisherman's Wharf (while it's still early, and there are no tourists out yet!) along the Embarcadero, to the Ferry Building. It's a fairly flat route, and oh-so-picturesque. Really, just perfect since I don't get to see as much of San Francisco as I used to. Sandy, ordering some tasty treats from the Acme Bread Co.
Sandy, presenting Birthday Girl, Monica, with a Birthday cupcake! The second half of our walk was equally beautiful as the first, only it was much more steep and challenging! 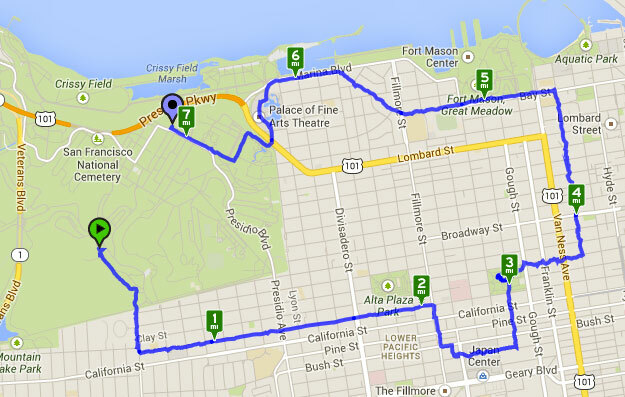 We walked through the Financial District, through North Beach, and UP into Russian Hill. We had thought that Lombard Street had been closed to traffic today, but it turns out that it wasn't. It wasn't nearly as busy with cars as most days, but maybe that was only because it was still earlier in the day. I've been a Plum Jam making machine!! 27 more jars made tonight. There aren't many plums left on the trees, but I'm hoping to get one more batch out before I leave this week. The First Two batches of Plum Jam of 2014! Plumpocalypse came early this year, due to the drought. My Gay Boyfriend had already composted about 65lbs of plums over the last two weeks, before I came home. The really good news: the new net system worked REALLY well! They made it so much easier to collect the plums, with a lot less of a mess. So wonderful that we got it figured out. My Mom helped me with the first batch. I was able to recall the recipe and steps from last year. Not hard, just takes a while. It was great to see Ken and Judy, the owners, and catch up. I've been going to U-Lee (and have known Judy) for 20 years!! I signed up for a Clear Membership this week. I finished the process at the Clear booth at SFO when I landed Friday. Should have my card delivered within a couple of weeks. Hopefully, it'll come before my next trip to SF! This afternoon, we took my parents to the Boeing Factory Tour & Future Flight of Aviation Center. Yep, it's the factory where Boeing makes their planes. It's excessively cool. Bonus: It's only about a 30 minute drive from our home in Bellevue. Unfortunately, we were not allowed to take any photos from within the Factory. You'll just have to trust me that it's crazy cool to see the assembly line of sorts that make an airplane. Actually, we were surprised to learn that about 99% of the building of the planes is done by manual assembly. The Future Flight of Aviation Center is a museum of sorts that has some nice exhibits of planes, history and parts. Worthwhile to check out while you're at the tour of the factory. My seconds glassybaby seconds sale! Mom and Dad are here again!! First Training Walk of the 2014 Season!